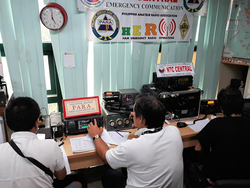 With Typhoon Mangkhut (locally Ompong) threatening, the Philippine Amateur Radio Association (PARA) activated its Ham Emergency Radio Operations (HERO) at a Code Yellow level on September 12, per a declaration from PARA Chief Operating Officer Roberto Vicencio, DU1VHY. At Code Yellow, stations are advised to ensure that all equipment is operational, check backup power sources, and take any necessary precautionary measures. For the first time ever, the Philippines National Telecommunications Commission (NTC) had authorized PARA/HERO volunteers to communicate directly with NTC's regional offices during the pending emergency, rather than through the NTC headquarters. Typhoon Mangkhut was the strongest typhoon to strike Luzon Island since Typhoon Megi in 2010, and the strongest typhoon to make landfall in the Philippines since Super Typhoon Haiyan in November 2013. A Category 4 storm on the Saffir-Simpson scale, Mangkhut was packing nearly 150 MPH winds, with gusts of more than 180 MPH as it approached a predicted September 14 landfall on extreme northern Luzon Island. 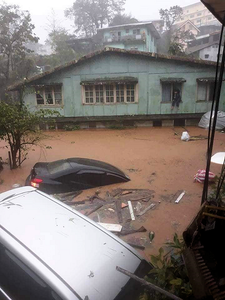 The storm inflicted widespread destruction, with heavy damage to structures, and caused landslides. More than 80 people lost their lives as a result of the storm. Evacuations were ordered in several regions. The storm went on to wreak heavy damage in Hong Kong. In the Philippines, volunteers Tonyo Casuga, DV1XND, and Aurell Rabena, DV1YMK, immediately activated PARA club station DX1PAR on 24/7 basis. The next day, DU1IVT, DU1VHY, DU1UGZ, DU1EIB, and DU1GG were expected to leave for Cotabato City in Mindanao for a HERO orientation seminar. PARA Director and former COO Thelma Pascua, DU1IVT -- who had been scheduled to travel to Mindanao for a HERO orientation seminar -- remained behind to oversee the activities of HERO volunteers on 40 and 2 meters and to coordinate with the various NTC regional offices. More than a dozen volunteers stepped up to help. Club station DX1ARC activated its Echolink node, and Ronald Hernandez, DU2RD, fed reports to HERO until September 15 or until telephone and internet services began to return. Rollydel Tamin, 4F2RV, contributed reports from Isabela Province. When the storm brought gusty winds and a lot of rain to Metro Manila on the evening of September 14, HERO experienced a sustained string of check-ins, with no fewer than 150 stations reporting from the start of the activation. According to HERO, reports also streamed in continuously on 2 meters in Metro Manila and nearby areas, while affiliated clubs activated their own HERO nets and passed whatever reports they received to the HERO emergency frequency. During the HERO activation, DU Net was called four times a day, aside from the continuous reports on weather conditions and monitoring of affected areas on 7.095 MHz. In central Luzon, PARA District 3 Manager Edilberto, DU3JA, supervised the activation of the NTC Region 3 station in San Fernando, Pampanga. NTC regional offices in Region 1, CAR, Tuguegarao, and Region 3 all coordinated with the HERO network on 7.095 MHz in addition to the regular NTC net frequency of 7.404 MHz, also staffed by ham radio volunteers at NTC headquarters. HERO reports included the status of telecommunication services and electrical power in the affected areas, as well as reports on casualties, flooding, and health-and-welfare traffic. Several stations in the least-affected areas of Mindanao and Visayas supported HERO by acting as relay stations during periods of poor propagation. HERO activity for Mangkhut (Ompong) stood down on September 16. 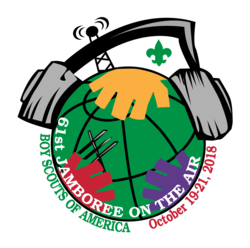 Scouting organizations are still registering to participate in the 2018 Jamboree on the Air (JOTA) over the October 19 - 21 weekend. With about 1 month to go, JOTA Coordinator Jim Wilson, K5ND, told ARRL that registration is "probably on target" at this point. US registrations stood at 235 as of the end of last week. Right after JOTA 2017, 489 US locations had signed up, although that included both Jamboree on the Air and Jamboree on the Internet (JOTI) participants, which, Wilson said, the Boy Scouts of America (BSA) have "remained steadfast" in considering JOTA and JOTI as separate events, although, he noted, this is not the case at the world level. "Our goals are primarily to grow participation," Wilson told ARRL. "The World JOTA-JOTI Team has set a goal of 3 million participants by 2021; 2017 saw 1.5 million worldwide. Sign-ups at the world level right now are at 1,428 locations. Wilson said that, in the US, many locations wait until the last minute to register their participation. In 2017, some 7,900 Scouts took part in JOTA, down by nearly 10,800 participants from 2016, but topping participation for 2014 and 2015. Total radio contact numbers were down from 2016 and 2015. "We've also put in place a number of aids to help people improve their on-the-air experience, which will be challenging without sunspots," Wilson pointed out. "We've provided a video of how to work HF for JOTA. We've also provided a quick reference card to help Scouts during the QSO." Recommended JOTA frequencies are listed on the K2BSA website. "Operators should note that these frequencies are starting points to find QSOs," Wilson added. "They can also turn the dial to find other stations on the air. It's not like a repeater." A list of Girl Scout activities supported by JOTA-JOTI has also been posted. Held each year on the third full weekend in October, JOTA is the world's largest Scouting event. JOTA uses Amateur Radio to link Scouts and hams around the world. Scouts of any age and gender can participate, from Cub Scouts to Boy Scouts and Venturers. Radio amateurs at the local level are encouraged to work with a scout council or unit to set up a JOTA station or arrange to have Scouts visit their shacks. "You can also participate just by making QSOs with the many JOTA stations that will be on the air," Wilson said. "Volt-Ohm Meters" is the topic of the new (September 27) episode of the "ARRL The Doctor is In" podcast. Listen...and learn! 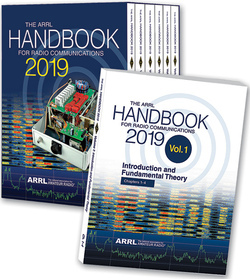 The 2019 edition of The ARRL Handbook for Radio Communications is now available as a six-volume boxed set in a handsome hard slipcase in addition to the traditional, soft-cover print edition. Both editions include a unique download code, so you can download and install a fully searchable digital edition of the printed book, as well as expanded supplemental content, software, PC board templates, and other support files. The Handbook Six-Volume Boxed Set, ARRL Item No. 0895, ISBN 978-1-62595-089-5, is $64.95 retail. The Handbook soft-cover edition, ARRL Item No. 0888, ISBN 978-1-62595-088-8, is $49.95 retail. Order from the ARRL Store, from your ARRL Dealer, or call (860) 594-0355 or toll-free in the US, (888) 277-5289. Shipping in early October. The Handbook Kindle edition comes in six separate volumes, automatically delivered to your Kindle, starting on October 8, $9.99 per volume (Vol 1, Vol 2, Vol 3, Vol 4, Vol 5, Vol 6). The ARRL Foundation will begin accepting scholarship applications on October 1 from eligible radio amateurs planning to pursue post-secondary education in the 2019-2020 academic year. Completed applications must be received by January 31, 2019. Individuals and clubs support many of the more than 80 scholarships, ranging from $500 to $5,000, that are awarded annually. Applicants for all scholarships must be active radio amateurs and must complete and submit the online application. "The ARRL Foundation Board of Directors is honored to be able to continue to offer scholarships to assist Amateur Radio operators in offsetting the costs of higher education," said ARRL Foundation Secretary and ARRL Development Manager Lauren Clarke, KB1YDD. "All ARRL Foundation scholarships are made possible by individuals or clubs, and we are grateful for their support." Students planning to apply for 2019-2020 academic year awards should first carefully review the eligibility requirements and scholarship descriptions. Although only one application per applicant is required, applicants may ask to be considered for as many of the scholarships for which they are eligible (some scholarships have geographic criteria or other requirements). Check off only the scholarships for which you would like to be considered. In addition to completing the online application, applicants must submit a PDF of their academic transcript from their most recently completed school year (emailed to foundation@arrl.org). Applications are due on January 31, 2019, by 11:59 PM ET. Applications without accompanying transcripts will not be considered. Awards winners are typically notified in mid-May by USPS mail and email. The South African Radio League (SARL) and AMSAT-SA are taking the ham radio/citizen scientist concept to the Southern Hemisphere. The new organization will be known as Amateur Radio Science Citizen Investigation, or HamSCI SA, and will be based on the successful HamSCI now operating in the US and the UK. The HamSCI concept was developed by American scientist-radio amateurs who study the upper atmosphere and space physics. According to a recent ee publishers article by Hans van de Groenendaal, ZS6AKV, HamSCI SA will be a platform for publicizing and promoting projects that advance scientific research and understanding through Amateur Radio activities, encourage the development of new technologies to support such research, and providing educational opportunities for the amateur community and the general public, with a focus on youth. "Hans van de Groenendaal interviewed both Phil Erickson, W1PJE, and me over Skype a few months ago," HamSCI's Nathaniel Frissel, W2NAF, told ARRL. "I'm quite happy that they are doing this." The South African umbrella association will link up with scientists in various electronics and physics disciplines to enhance research opportunities. SARL and AMSAT-SA currently are involved in 5 MHz propagation research, and a study of the rapid increases in the RF noise floor, its causes and possible mitigation, plus the possible mitigation of noise pollution that could ultimately render the radio spectrum useless, particularly for weak-signal communication. HamSCI SA will provide a platform to foster collaborations between professional researchers and radio amateurs. "It will assist in developing and maintaining standards and agreements between all people and organizations involved," van de Groenendaal wrote. "HamSCI SA will not perform research on its own. Rather, it will support other research programs such as the SARL's 5 MHz propagation study, the RF noises monitoring projects, and programs funded by structures such as the National Research Foundation." SARL and AMSAT SA have invited interested individuals to join the HamSCI SA initiative and offer their expertise. "It will work two ways," remarked SARL President Nico van Rensburg, ZS6QL. "It will create interesting activities for radio amateurs, in particularly for the new generation of young people who have been bitten by the 'radio bug' but need more challenges than just communications. For the scientific community it means that they can involve many more people in their projects and make a contribution to make science popular." In the US, HamSCI's first major project was to study the effects on the ionosphere of the August 2017 solar eclipse, the path of which traversed the continental US and caused large-scale changes in ionospheric densities. Effective on November 1, radio amateurs in Sweden who want to run more than 200 W PEP in certain Amateur Radio allocations will have to apply for a transmitter license to do so. Sweden's telecoms agency PTS has announced a modified listing of license-free transmitters that spells out the changes for Amateur Radio and other services. Sweden eliminated Amateur Radio licenses in 2004, and Amateur Radio in Sweden is "permission free," but prospective radio amateurs still must pass an examination. A certificate and a call sign, valid for life, are issued without any future fees. Up until now, the maximum permitted power on most HF bands has been 1 kW with no additional authorization required. "It will be interesting to see how many active [Swedish] operators will apply for high-power permits," said Henryk Kotowski, SM0JHF, who alerted ARRL to the release of the official PTS order. "I will not. There is a general trend to use less power and smarter, efficient modes." Under the amended regulations, radio amateurs would have to apply for permission to run more than 200 W on 160 (1,810 - 1,850 kHz only), 80, 40, 20, 17, 15, 12, 10, and 2 meters, as well as 70 centimeters, and the 1.2, 5.6, 10, 24, 47 GHz, and higher Amateur Radio allocations. Power restrictions would continue to apply on the 2,200 and 630-meter bands (1 W ERP), on certain segments of 160 meters, and on 60 meters (15 W EIRP), 30 meters (150 W PEP), and 6 meters (200 W PEP). The new regulations would require contesting and moonbounce enthusiasts to register their fixed installations in order to use a high-power amplifier. The fee to register to operate with more than 200 W PEP would be approximately $32 US. Permits will be issued for 3 years and renewed automatically, assuming the conditions for granting the permit are still met and comply with all rules. Individuals or clubs may register up to five different fixed locations. The VP6D Ducie Island 2018 DXpedition October 20 through November 3 will use DXA to post contacts on a near real-time basis. "Bob Schmieder, KK6EK, of Cordell Expeditions, offered the use of DXA, and we gladly accepted," the DXpedition said in a news update this week. "Within 60 seconds of your contact with VP6D, the browser page is automatically updated to show your call sign; this confirms that your contact is in the log (DXA reads the VP6D log). This process eliminates the need for duplicate contacts on the same band/mode and minimizes the confusion caused by pirates or other DXpeditions operating at the same time." The DXpedition leaders said they performed an end-to-end test of the DXA system, and expressed confidence that DXA "will significantly reduce, or eliminate, the hundreds of emails asking for 'log checks.' If you see your call sign on DXA, you're in the log." The VP6D Ducie Island 2018 DXpedition will continue through November 3. The VP6D team also plans to put Ducie Island on 6-meter moonbounce for the first time ever. Operation will be on 50.200 MHz using JT65. Amateur Radio retailer Radio City, Inc. of Mounds View, Minnesota, has announced it is closing. "It's been a wonderful 36 years for us at Radio City, and we have decided to retire and close," owners Dan, KB0XC, and Maline Fish said in a message on the retailer's website. "We are so thankful for the many years of support, and we have enjoyed working with you, our customers. The technical, intelligent, and polite conversations plus advice have been invigorating, thus making this decision extremely difficult for us." The Fishes said they will shut down by year's end, "or a bit sooner, as we empty our shelves of new and used materials." Their last stop on a "final goodbye tour" will be Fallfest in Carlton, Minnesota, on September 29. A goodbye party is set for October 6 at the store. The Larkfield Amateur Radio Club (LARC) in Huntington, New York, provided communication support for the 41st Northport Great Cow Harbor 10K / 2K Run on September 15. The nonprofit event is held in cooperation with various community organizations. LARC members provided communications from the starting point, at various positions along the course, and at the finish line. One LARC radio operator equipped with a radio took part in the race, and an EMT-radio amateur rode a Northport Fire Department Gator that traveled the course. A net control station with two radio operators was established to monitor and direct all communications and to contact EMTs when needed. Three medical needs that occurred during the event were swiftly resolved. Eighteen LARC members participated, assisted by two members of the Great South Bay Amateur Radio Club (GSBARC). Tad Cook, K7RA, Seattle, reports: The sun has continued spotless over the past week, and as of September 26, it's been 2 weeks with no sunspots. The average daily solar flux declined from 68.6 to 67.9. The average planetary A index increased from 9.7 to 10.9, while the average mid-latitude A index declined from 8.3 to 7.9. 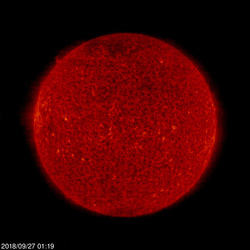 Predicted solar flux is 68 on September 27 - October 2; 70 on October 3 - 10; 68 on October 11 - 28; 70 on October 29 - November 6, and 68 on November 7 - 10. Predicted planetary A index is 5 on September 27 - 30; 8 and 12 on October 1 - 2; 5 on October 3 - 6; 20, 35, and 10 on October 7 - 9; 18, 15, and 8 on October 10 - 12; 5, 10, and 8 on October 13 - 15; 5 on October 16 - 17; 10 and 25 on October 18 - 19; 15 on October 20 - 21; 10 and 8 on October 22 - 23; 5 on October 24 - 27; 10 and 12 on October 28 - 29; 5 on October 30 - November 2; 20, 35, 10, and 18 on November 3 - 6, and 15, 8, 5, and 10 on November 7 - 10. Sunspot numbers for September 20 - 26 were 0, 0, 0, 0, 0, 0, and 0, with a mean of 0. The 10.7-centimeter flux was 66.6, 66.9, 67.9, 68.4, 68.6, 67.6, and 69, with a mean of 67.9. Estimated planetary A indices were 2, 9, 27, 12, 7, 11, and 8, with a mean of 10.9. Estimated mid-latitude A indices were 2, 6, 20, 9, 5, 7, and 6, with a mean of 7.9.